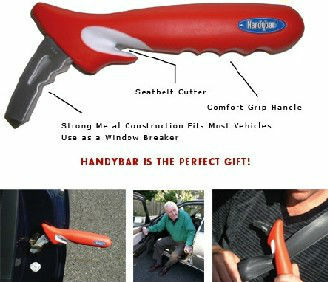 A portable handle to assist with getting in and out of a vehicle. Locking the steel section onto the “U” on the striker plate of the door, you have a handle to hold onto that is strong and stable. This also has a seat belt cutter incorporated into the handle and the steel end of the handy bar can be used to smash a window in an emergency situation.